Australia has upped its national terrorism threat level for potential attacks on police, citing new intelligence reports. Police said recent attacks in France and Canada were a "sobering reminder of the risks" associated with policing. 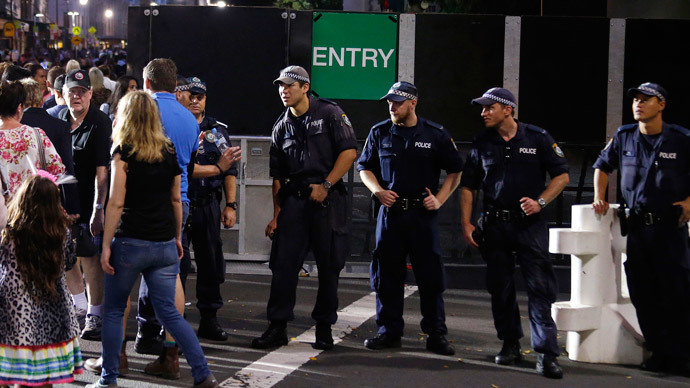 According to a statement from the Australian Federal Police (AFP), police across the country had "thoroughly reviewed their security and risk management strategies and made necessary adjustments to their protective security policies and practices." The threat level for police has been changed from medium to high for officers across the country. Australia's national alert level was raised to high in September last year, meaning the risk of a terrorist attack was likely. Officers have been told to keep social media profiles discreet, with security stepped up at local police stations and officers told to log in to mobile tracking devices in police cars whenever they leave the station, The Sydney Morning Herald reported. Western Australia's acting police commissioner Stephen Brown told WA Today he would no longer hang his blue shirt in the back of his car for fear of getting targeted. "It saddens me that our police who work tirelessly in an already challenging environment to make out community safe, could be viewed by some as potential targets," he said. Queensland police will also be "a bit more cautious" after the terror threat level against law enforcement officers has been raised, according to Police Commissioner Ian Stewart. "In terms of the public, it is very unlikely they will see too much change because in reality we made all those changes back in September in that build-up to G20 and when the national (terror threat) level went up," the Brisbane Times has quoted him as saying. Victoria Police Acting Chief Commissioner, Tim Cartwright, has urged police, protective services officers and public servants to "be vigilant, and pay extra attention to their own safety and security, and that of their colleagues and their premises." The security environment these days remains "increasingly complex and challenging," the AFP said in a statement on Tuesday. Australia, an ally of the US in its fight against the Islamic State group in Syria and Iraq, is in for potential attacks by supporters of the militant group. “While relatively small, there are increasing numbers of Australians who are connected with or inspired by overseas terrorist groups such as the Islamic State of Iraq and the Levant (ISIL), with the intent and capability to conduct an attack against police,” the AFP statement has warned. In September, an 18-year-old man, reportedly associated with a radical Islamic group called Al-Furqan, was shot dead after stabbing two police officers from the Joint Counter Terrorism team in Melbourne a day after the Islamic State commanded Muslims to kill ‘unbelievers’ in countries from the coalition fighting the extremist group. In December, two hostages and a gunman were killed after police stormed a Sydney cafe to halt a 16-hour standoff with the attacker who identified himself with radical Sunni Islamist groups. Two gunmen were killed in Belgium last week, following raids against an Islamist group planning to attack police. Two police officers were also among the 12 people killed earlier this month in Paris by the Islamist gunmen who attacked the office of the French satirical weekly Charlie Hebdo. In October, a soldier was killed during an attack by an Islamist radical on the Canadian parliament. The AFP said in the statement that the incident also affected their decision to raise the threat level against Australia's police.